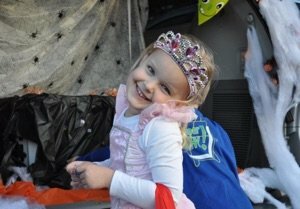 The North Branch Reformed Church Preschool welcomed over 200 participants to our 2nd Trunk or Treat sponsored by our PTO! Preschool families wowed us with their creativity, decorating their trunks with themes like outer space, Despicable Me, beach, Toy Story, harvest, grocery store, and more. Preschoolers and their siblings visited 44 trunks, collecting special treats like nut-free candy, hot chocolate packs, glow in the dark sticks, and pretzels. 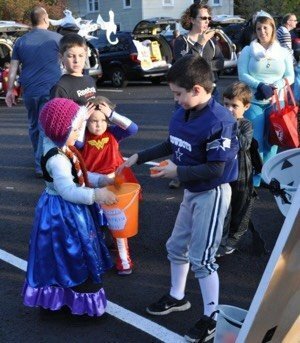 After gathering their treats, they played games, picked a pumpkin at the “Preschool Pumpkin Patch,” received tattoos or face painting, voted on who they thought had the “Best Trunk,” guessed the weight of the big pumpkin, and enjoyed munchkins and apple cider. Congratulations to the Hall family on winning the “Best Trunk” award – a family pack to Alstede Farm in Chester – and to the Lienemann family for guessing the weight of our 38 pound pumpkin! Special thanks to Dream Dinners of Flemington for hosting a table and sharing their yummy soups, Arvin’s Garden Center for donating the small pumpkins, Linda’s Farm Stand for donating the big pumpkin, and Alstede Farms for donating the family packs. Thank you to Christine Childs, PTO President, and PTO members Sharon Sushko, Christeen Scarpa, Helene Lombardo, Kathleen Scibelli for their help! And Preschool Board members, Wendy Baker, Melanie Brown, Charlotte Pluymers, Jennifer Russo, and Pastor Mark Swart.